Bachelorette buffs up for TEN, but Seven wins Wednesday. TEN’s Bachelorette is off to a good start, landing second in its timeslot with 875,000 viewers. Last night the show topped the demos and trended at #1 on Twitter. It looks like audiences aren’t only just keen for a fairytale ending for Sam Frost -but to marvel at the wonders of Aussie blokes in a pack mentality. Less successful was the debut of Scream Queens -at 319,000 it was unable to benefit from its lead-in. Even fewer followed on ELEVEN, but it suggests that TEN may be right to slate this as a multichannel show. X Factor won its timeslot for Seven on 953,000 as Simon Cowell helped choose the top 12 -the lucky dozen will be told tonight. Gruen cut through the 8:30 offerings for ABC well ahead of a thinly-constructed Celebrity Apprentice. Nine fared better with Nine News and Today, both winning their timeslots. Seven network won with 29.1% then Nine 25.0%, TEN 20.4%, ABC 19.4 and SBS 6.1%. Seven News (980,000 / 955,000) was best for Seven then The X Factor (953,000), Home and Away (791,000), Pets Make You Laugh Out Loud 2 (644,000) and The Chase (564,000 / 424,000). Britain’s Busiest Airport: Heathrow was 242,000. Nine News topped the night with 1.02m / 1.01m. Next for Nine were A Current Affair (881,000), The Block (753,000), Celebrity Apprentice (555,000) and Hot Seat (554,000). World’s Biggest Pets was 301,000. The Bachelorette has launched to 875,000 for TEN. The Project was 685,000 / 453,000, TEN Eyewitness News was 518,000 and Scream Queens debuted with 319,000 -only 152,000 followed the show to ELEVEN for a second episode. Gruen ruled for ABC with 900,000. Next were ABC News (834,000), Utopia (803,000), 7:30 (735,000), How Not to Behave (472,000), Would I Lie to You? (462,000) and Antiques Roadshow (326,000). On SBS it was Great Continental Railways (343,000), 24 Hours in Police Custody (177,000), Bosch (153,000) and SBS World News (148,000). Shaun the Sheep showed up multichannels with 277,000 for ABC2. Tags: 24 Hours in Police Custody, 7:30, A Current Affair, ABC News, ABC News Breakfast, Antiques Roadshow, Bosch, Britain's Busiest Airport: Heathrow, Celebrity Apprentice, Great Continental Railways, Gruen, Home and Away, Hot Seat, How Not to Behave, Nine News, Pets Make You Laugh Out Loud, SBS World News, Scream Queens, Seven News, Shaun the Sheep, Sunrise, TEN Eyewitness News, The Bachelorette, The Block, The Chase, The Project, The ﻿X Factor, Today, Utopia, World's Biggest Pets, Would I Lie To You? I watched 5 minutes of celb apprentice last night while waiting for Hell’s kitchen to begin. In that time I remembered how annoying Blake’s voice is, Gaby much to Jame’s amusement was still hanging around and Tim thought you could eat fish fingers cold and serve fairy bread to a group of people on a ship. Im going to avoid it. A dull episode. Think Fremantle has served up bit of a dud this time. A few animal shows on last night – Pets make you laugh out loud, world’s biggest pets and the Bachelorette. Good to see the number of shows catering for all those animal lovers watching. I watched Scream Queens just a moment ago, I had no idea it was on Ten\Eleven last night. It was not too bad, will see how it goes. I’m finding it disappointing that ABC1 are following in the commercial networks footsteps with stupid timeslots, like 9.07pm for Utopia. Even Media Circus doesn’t start at 8pm because ABC are squeezing in more commercials between shows. As a male who admits to watching it, i did not expect to like The Bachelorette more than the Bachelor. I too hadn’t intended watching Scream Queens but the first episode on Ten was fantastic – I then switched to Eleven to watch the second episode – this is my new guilty pleasure. 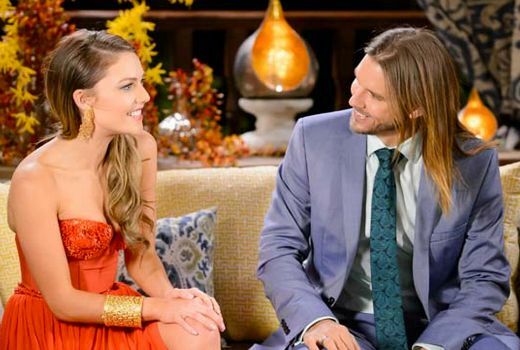 The Bachelorette was fun – Sam looked gorgeous but some of the guys in there are just dire – she comes across a smart little cookie so I’m sure she’ll flick that model guy pretty soon! I can watch 94 minutes of X Factor in 21 by IQ’ing it, skipping the first 6 minutes of introductions, recaps from past episodes, then skip the introduction to the first singer, their back story, their past performance and what the judges had to say about it, and then skipping what the judges say after their performance (i sometimes listen to one, because 9 times out of 10 they all either love or dislike the performance, I don’t need to hear that in 4 different ways). Then skip the 3 ½ minute ad break and the “Bonus Extra” one ad before the show comes back… rinse and repeat. Despite a Screen Producers nod for Best Light Ent, surely How Not to Behave will be a one season wonder? To lose nearly half of 7.30’s audience, and to then to have some 450,000 switch back for Gruen is not good. Even Utopia keeps all but 100,000 of Gruen’s big numbers. I was surprised it got a nod by SPA. It does clever recreations and creative use of graphics and actor’s performances, but i don’t buy the chemistry between the hosts.There are many other magazine type shows, or packaged lifestyle series that could have been included in the nominations. Yes, completely agree. The hosting is still very stilted [tho I really think Gretel is usually a great host – they have been mis-matched]. The recreations and graphics are funny and well done. As I record just about everything I plan to watch – I F/F thru the host’s “banter” now. Scream Qeens was fantastic! I hadn’t even planned to watch it but the promos during The Bachelorette sucked me in. Fantastic probably isn’t the word I would use…… It was weird! Only one show hit 1m (split into 2 to manipulate the table) and Daylight savings is yet to arrive. Wednesday is the new Thursday. Nobody was going to watch a double ep starting at 10:16pm, the best Ten could hope for was people checking it out and deciding to watch it Monday. But it’s B grade MA 15+ stuff and probably never going to get an audience anyway.